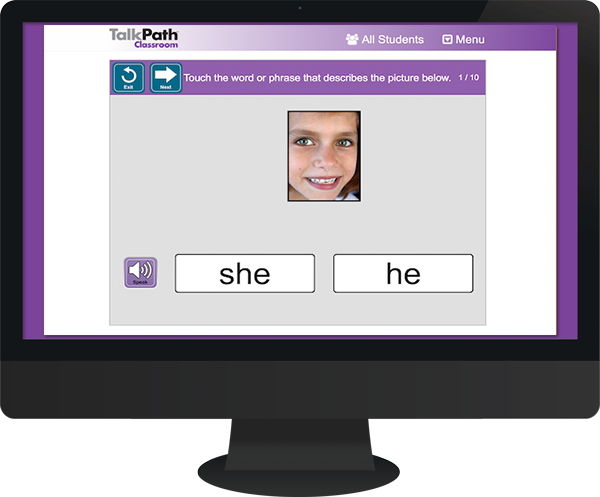 TalkPath Classroom is our proprietary software — available to all our clients completely free, round-the-clock, anytime and anywhere they want to access it. 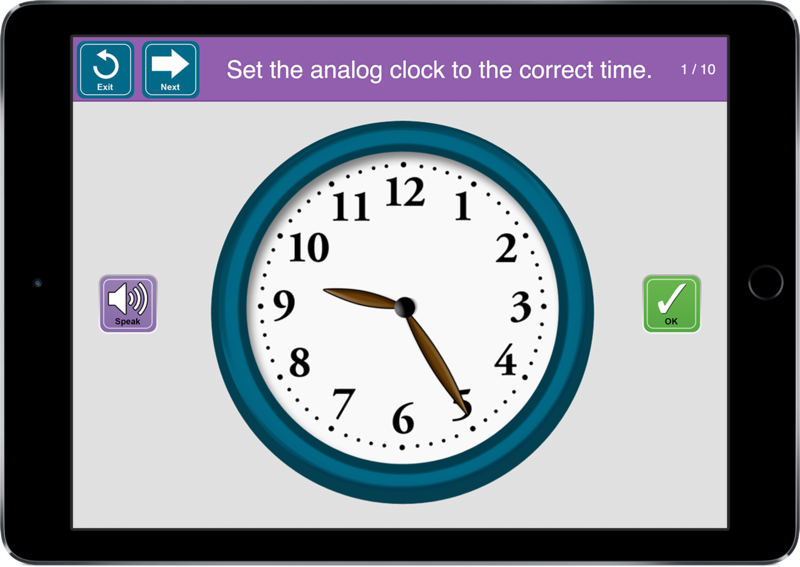 We call it our “practice platform” because learners can practice their skills acquisition and advancement after and between sessions for as long as they want, as often as they want, which critically extends learning time far beyond the timed therapist sessions. The platform has been designed to create the optimal user experience so that our clients can navigate easily, participate fully, and advance quickly. The highly stimulating content and multimodal functions ensure fun and fruitful engagement with the interface at all levels, for all users. A personalized plan is devised for every user, based on an initial analysis and needs assessment. Clinicians can change plans remotely between sessions, to keep online interaction as time-effective and targeted as possible. The platform is populated with an extensive array of scientifically developed exercises in themed categories and more than 13,500 language and cognition tasks, leading users to improve proficiencies, master skills, and achieve goals. 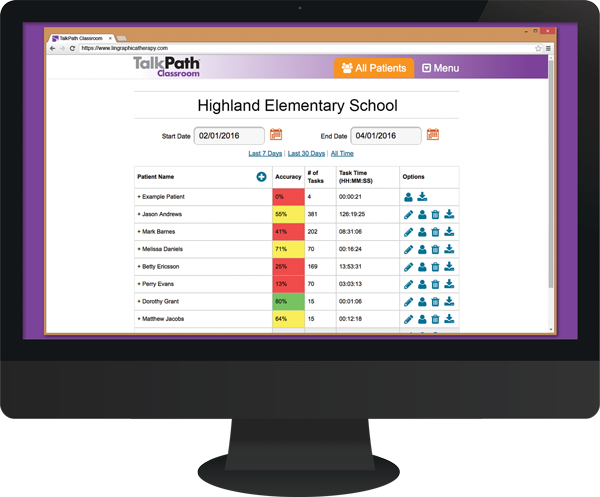 Role-based visibility is an integral component of the platform, creating distinct user roles and privileges — as appropriate — for students/clients, clinicians, school/program directors, and administrators. Detailed reporting capabilities built into the platform allow comprehensive measurement of performance metrics, low-level analysis of advancement, and accurate assessment of plan goals. The platform’s capacity to generate video progress reports, in addition to graphical and print reports, captures user gains in video clips that can be distributed to student’s whole support team. Automated documentation of all user participation with the platform enables unprecedented progress tracking that is both continual and personalized. 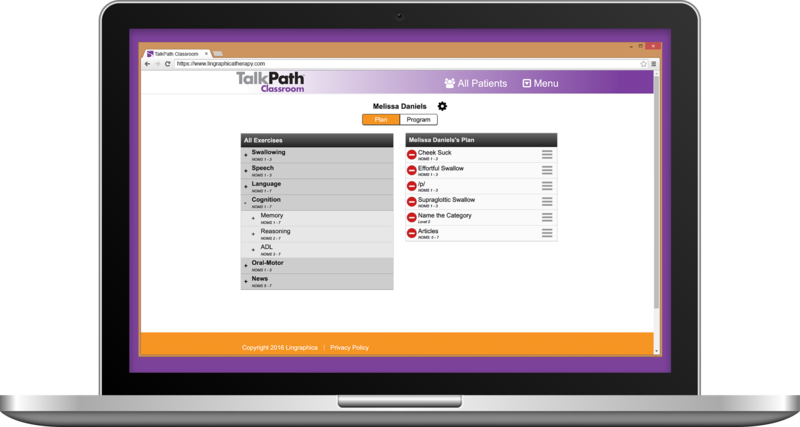 Our platform is HIPAA, FERPA, and COPPA compliant and runs on dedicated, secure servers. 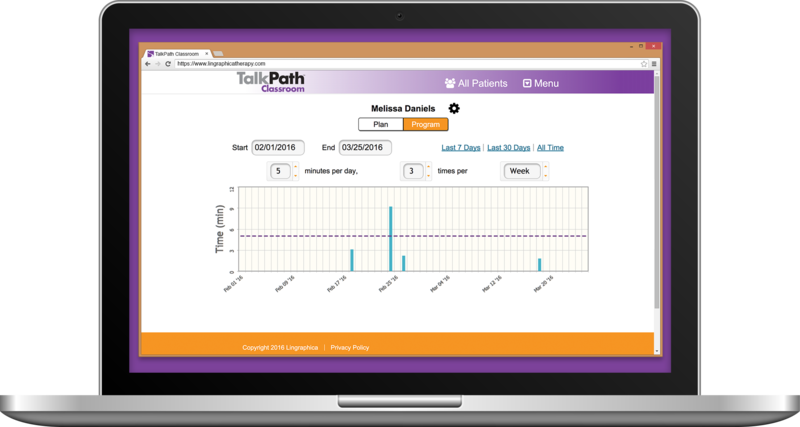 We offer full system setup, user training, and unlimited ongoing technical support to all TalkPath Live subscribers.